We hear plenty about the widening income gap between the rich and the poor in America and about the expanding distance separating the haves and the have-nots. But when detailing the many things that the poor have not, we often overlook the most critical--their health. The poor die sooner. Blacks die sooner. And poor urban blacks die sooner than almost all other Americans. In nearly four decades as a doctor at hospitals serving some of the poorest communities in Chicago, David A. Ansell, MD, has witnessed firsthand the lives behind these devastating statistics. 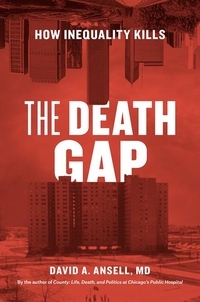 In The Death Gap, he gives a grim survey of these realities, drawn from observations and stories of his patients. While the contrasts and disparities among Chicago's communities are particularly stark, the death gap is truly a nationwide epidemic--as Ansell shows, there is a thirty-five-year difference in life expectancy between the healthiest and wealthiest and the poorest and sickest American neighborhoods. If you are poor, where you live in America can dictate when you die. It doesn't need to be this way; such divisions are not inevitable. Ansell calls out the social and cultural arguments that have been raised as ways of explaining or excusing these gaps, and he lays bare the structural violence--the racism, economic exploitation, and discrimination--that is really to blame. Inequality is a disease, Ansell argues, and we need to treat and eradicate it as we would any major illness. To do so, he outlines a vision that will provide the foundation for a healthier nation--for all.